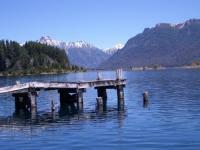 Blog from Bariloche, Argentina | Margaret in Wonderlands..
On the Wednesday we headed for Mar Del Plata. This is 6 hours south of Buenos Aires and it is a popular holday destination for the people of Argentina and particularly Buenos Aires. Well if you have been to Brighton then this is definitely Argentina's version of it :) Its uncanny how alike it is.. even the similar buildings so it felt a bit like home. The weather was not great when we were there, it was a little rainy the first day. However on the last day it brightened up .. bliss!! We arrived late afternoon on the Wednesday. The bus was an hour late and it was so slow but it was empty as well. We headed to our hostel which was called Pergamino and was more like a cheap hotel. We had our own room with cable TV, hello FX and Universal!! We headed out for some food as we were starving and had not been fed on the bus :( we took a look around town and then headed home. Sad as it was we really enjoyed having our own tv and could catch up on some shows. The next day we headed off to town and walked around the shops. I went into the gorgeous church on the main busy shopping street. They really do have pretty churches. There was a flea market there and a few stalls were open but I think we were to early. We basically spent the day eating and walking around. The only productive thing I did was to send a few postcards. We did walk out to the pier and watched some guys doing surfing but there were not many waves so they spent a lot of time in the water for very little action. Mar del plata has tons of bakeries on every street corner it seems so we totally indulged in lots of cakes and pastries. Never good for the waistline. Later on we headed for dinner at a restaurant near the sea and I had Hake and mashed potatoes which I really enjoyed. As much as I love chips and greasy food I am getting seriously bored of it. The next day was gorgeous so we headed down to the beach. There was a tango performance on the street near the beach and it was really good. We then went and sat on the dock with all the locals and chilled in the lovely sunshine. There were quite a few looky looky men who you get in Tenerife. Basically the black guys selling lots of cheap accessories. We had several hours to kill before the 7.30 bus to Bariloche which was going to be about 20 hours so we basically had lunch and walked around stopping for some treats along the way. It was a lovely little town to visit and it was a relaxing stop. I always love being near the sea. Our bus ride went pretty quickly but then I think you just get used to these trips now. We got fed well 3 meals and drinks every few hours if felt like..and they played eat pray love, the killers, the indestructables and some other show. On the Sunday we went to a lookout on the bus. We went with a girl from our room called Roz. Its called Cerro Campanario which is 1049 metres high and overlooks all the mountains and lakes and it really is something special. Apparently its voted one of the top national geographical spots. You get an open ski lift up there so Ellen did not really enjoy it. We took some beautiful pictures but I do not think my camera does them any justice whatsoever sadly. Ellen and Rachel left to head back to town and I stayed with Roz and had an empanada in the gorgeous cafe at the top which just overlooks all this amazing scenary..we just stayed and talked for a while and just enjoyed it :) Later on we headed back to town and got some food to cook. It was a tasty risotto for us and we chilled out in the hostel, it was really quiet that night so we had the massive tv and leather sofas to ourselves. The next day was a chilled day as I was tired from the late night. I walked around and sat by the lake and I write this from my hostel with its glass windows looking out onto the beautiful lake and mountains... it makes me smile. I really love it here.. Such a pretty place. One of my favourite spots of South America.